In this project the format of the poster was interpreted in the light of French culture sociologist Michel de Certeau’s philosophy on modernity. In his book ‘L’invention du quotidien. Vol. 1, Arts de faire’ Certeau argues that the gap between the homogeneity of the major scientific, political or philosophical stories and variety of everyday practices are unbridgeable. According to De Certeau there are two possible reactions to this problem: to either emphasize this gap or to pretend that it does not exist. In the latter solution life is brought back to simple abstractions. Certeau calls this ‘strategy’. In emphasizing the gap one searches for operations that theme this gap. This is what Certeau calls ‘tactics’. 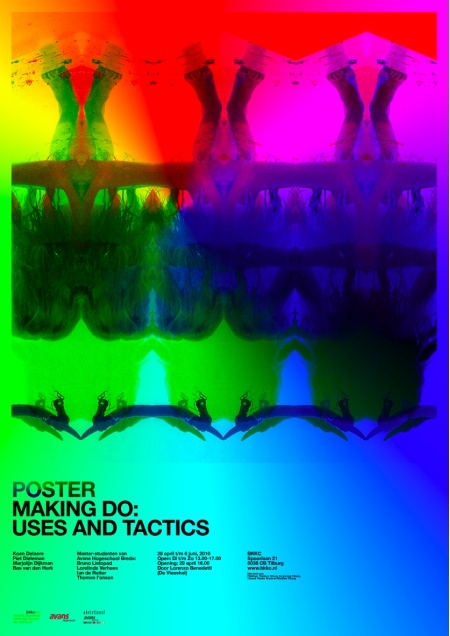 The format of the poster usually functions as a strategy. In Making Do the artists have approached the format of the poster in a tactical way. In doing so, they have not let homogeneity be their guide, but rather tried to emphasize the heterogeneity of images and their production methods.